Australia -v- New Zealand: Twickenham 31st October 2015, 4:00 p.m.
At first glance, there is a sense of crushing inevitability to the 2015 Rugby World Cup final line-up. Six weeks down and here we are with the world’s number one and two sides set to thrash it out for what would be an unprecedented third William Webb Ellis trophy. Yet, while the destination is as many have expected, the journey has been anything but predictable. Japan and Argentina, in particular, lit the tournament up and all told the gap between the superpowers and the perceived minnows has unquestionably decreased. In fact, before we go any further, remind yourself that you bore witness to the greatest upset in test rugby history just five weeks ago. In hindsight, while Saturday’s pairing now seems predictable it is, in fact, the first time the Trans-Tasman rivals have met in the Rugby World Cup final. Indeed by some strange quirk the sides have met only three times in World Cup history: 1991, 2003 and 2011. The Australians were victorious in the 1991 and 2003 meetings – the former including a David Campese masterclass in the once atmospheric stadium on Lansdowne Road while the All Blacks cruised to a facile victory in Eden park in 2011. The bookies have New Zealand as fairly significant favourites, but there are several reasons to suggest that the game could swing either way, not the least the fact that New Zealand is not the same side in World Cups on foreign soil. This is not opinion, but plain, old fact. Meanwhile, the Australians have prevailed twice on northern shores –Twickenham in 1991 and Cardiff in 1999- while actually dropping the only final ever played in Australia in 2003 to the Jonny Wilkinson inspired English side. That they made the final in 2003 was largely thanks to Eddie Jones mining all the potential talent from a pretty underwhelming team. Some will stay that statistics when combined with history, are largely irrelevant, but the obvious analytical take away from the above would be that Australia’s performances have actually been better in European World Cups with the All Blacks preferring and thriving on their own turf. This New Zealand side, though, has been a different type of beast to its predecessors and can boast a year-long global dominance, in 2013, where all-comers were vanquished. There is a Michael Jordan-like resolve to the side, never encapsulated better than during last weekend’s grind against South Africa or, as impressively, in the record making victory against Ireland in November 2013. The All Blacks do not have bad years or particularly bad sides – like Tom Brady they’ve never had a losing season- but the current edition are possessed of the unwavering self-confidence usually reserved for all-time great sides. Which is precisely what the 2015 edition of New Zealand are. The Americans would be fawning over the statistics. A full calendar year unbeaten and a win ratio of almost 91% over their last 57 games (48:2:3). And yet many judgments of the side will be moulded on the outcome of Saturday’s game. One result should not categorise or define a team, especially in the case of an All Black side which already has so many incredible achievements under its belt. Yet, to a certain extent it will. Win against the Australians and they will justifiably enter the debate for the arbitrary classification of the greatest international rugby side ever. Lose and they will be perceived, probably unfairly, as an excellent side who could not deliver on the biggest stage. Particularly away from home comforts. Australia, on the other hand, seem to be entering this contest with something of a free pass, insofar as a two-time winner can be granted such when going into a decider with their greatest rivals. Where New Zealand have continuity -former coach Graham Henry seamlessly passed the reins to his assistant Steve Hansen after the 2011 World Cup victory- Australia were in seeming disarray only a year ago. Under-fire coach, Ewan McKenzie was left with little option but to retire after the Di Patson imbroglio, leaving a disparate, ill-disciplined group of players behind. Unearthing talent has rarely been an issue for the Australians so their requirement was for a strict disciplinarian with winning credentials. How fortunate then that the well-travelled, hardnosed Michael Cheika was open to an upgrade from his role at the New South Wales Waratahs. Similar to the scenario that faced him in Leinster in 2005, Cheika knew that he would be given a richly talented squad with questionable character. This time, however, he would have eleven months to prepare an international team for the World Cup. The four-year cycle could not have gone any differently on either side of the Tasman. Serenity versus chaos. And yet, after a victory a piece this August, the sides meet in the most monumental rubber match one could imagine, a World Cup final. It sounds lazy at this stage to say this, but the battle of the breakdown on Saturday will go a long way towards deciding the victor. It seems centres and latterly back rows have been the only point of conversation during this World Cup, but their influence on the game is undeniable. Dominate the breakdown and, for the most part, you dictate the pace of the game, controlling the flow of the ball in both directions. The duel is not dissimilar to that of half forward and half-back lines in hurling. True, there are mini-battles taking place all over the field but perhaps none more important than the one on the ground. All eyes will be on man of the moment David Pocock and, in his last game, the legendary, Richie McCaw. Ordinarily, one would cast the iconic Richie McCaw along with Kieran Reid and Jerome Kaino as the favourites to dominate this joust but Australia’s trio of David Pocock, Michael Hooper and the unheralded Scott Fardy are far closer to the extraordinary. We don’t have enough time to sing the praises of McCaw. Suffice to say he is the greatest forward that we and many others have ever had the privilege of watching. However, all recent talk has been dominated by the otherworldly David Pocock and his lieutenant Hooper. Hooper and Pocock are both nominally open-side flankers, built in the mode of the traditional hunter-gatherer seven. So when Cheika decided to pick the duo with a view to subduing the Kiwi ball supply back in August more than a few eyebrows were raised. Unsurprisingly, questions were asked as to whether a back row could be balanced with two such similar players present. The answer was an unequivocal yes as the duo thrived at the breakdown, aided by the simple though incredibly effective tactic of picking apart the Kiwis around the edge of the ruck. When Pocock has been available during this tournament, he and Hooper have been outstanding, never more obvious than in their rucking masterclass against the Argentinians. True, the South Americans played into their opponents hands by running at every opportunity even when tactical acuity required otherwise. Time and time again, though, the Argentinian ball carrier was engulfed by a gold shirt and then pounced on by the arriving groundhogs. South Africa and particularly Francois Louw were successful in slowing down New Zealand’s ball last weekend and as Gordon D’Arcy already pointed out this week, Louw is not the ball-winner that Pocock is. The All Blacks historically have committed very few players to rucks so tomorrow poses somewhat of a conundrum. New Zealand will probably kick the ball quite regularly, unlike Argentina, thus guaranteeing field position and only then will they commit heavily to contest the ball on the ground. The Australian back row is almost more dangerous without the ball than with it so New Zealand will want to avoid unnecessary traffic. At the first sight of a contest Australia will, as New Zealand always have, pounce at speed. The breakdown as a spectacle is going to be incredibly enthralling. While we have for the most part lauded Australia we would do well to remember that the reigning champions themselves have one of the greatest backrows of all time. 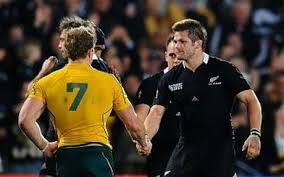 Richie McCaw’s value to New Zealand is like that of late career Brian O’ Driscoll or Paul O’ Connell. He was -as O’ Driscoll and O’ Connell were- probably a better player four years ago, in terms of measurable statistics, but his presence has never been more valued than now. Fans of sabermetrics are almost contemptuous toward anyone who values a player’s character or leadership but if McCaw was to go down this evening to be replaced by Sam Cane –as good a pure rugby player- the whole of New Zealand would be distraught. Morgan Parra might not, though. If the back rows cancel each other out, insofar as they can, then New Zealand should win. And, believe it or not, it won’t come down to the titanic midfield battle. No, New Zealand hold the clear upper hand at half back where, in Aaron Smith and Dan Carter respectively, they possess the best scrum-half in the world and the best out half of all time. Not only that but Carter has returned to Lions 2005 form which in effect, makes him peerless. Australia are hardly weak in this department but Will Genia, though certainly resurgent, is not the player of four years ago. Meanwhile, Bernard Foley is clearly possessed of an astounding skill-set but there are still question marks over his big game mentality. Though he nervelessly kicked the winning penalty against Scotland in the quarter-final, it seemed as if he zoned out for large parts of the second half. Smith and Carter beat Genia and Foley every single time. But rugby is not that simple. Dan Carter, probably the greatest out half of all time, may well prove the difference in a tight affair. Once their tails are up Australia are able to forget the bad times in an instant and right now they are playing their best rugby….. ever? And, they are the only team who, relatively speaking, have New Zealand’s number. Yet, tomorrow, we will be watching possibly the greatest All Black side to ever take the field. So, on which side do we fall? This New Zealand team has shown the ability and composure to overcome all challenges presented to it thus far. Yet, in twelve months, Michael Cheika has quite phenomenally reorganised the listless Australians. Victory tomorrow would surely be the greatest achievement in Michael Cheika’s career and of the most impressive turnarounds in rugby history. Steve Hansen has the chance to helm the first back-to-back winner of the tournament. So hard to call, as it should be. With little certainty, we’ll go with New Zealand to retain and take their place in history.